Kabocha winter squash (Cucurbita maxima), like all Cucurbita species, is originally from the Americas, and was modified through selection with time to create the current kabocha type. The Portuguese brought many crops they found while colonizing Brazil and to Asia, including cucurbits. Many sources anecdotally state the following as to where the name kabocho comes from: What is now kabocha was introduced to Japan by Portuguese traders in the mid-16th century via Cambodia. The word kabocha is thought to have originated from a mixture of the word “Cambodia” and the Portuguese word for pumpkin, abóbora. Kabocha is similar in size and taste to buttercup types of hard squash without the characteristic bump on the bottom. Kabocha has a very hard, dark green rind and yellow to bright orange flesh. The flavor is very sweet, tasting like a cross between sweet potato and pumpkin. Kabocha is a popular vegetable in Japan being used in soups, sushi, and tempura dishes. Kabocha varieties have been introduced into Latino markets where it is used as a substitute for calabaza . A research trip to 10 Latino stores in the Washington Heights section of Manhattan in 2006 found only one store that had calabaza for sale (Figure 1, Figure 2, Figure 3). All stores had kabocha types that they were selling as calabaza. There are a few advantages of kabocha in the Latino market over traditional types of calabaza, which are much bigger than kabocha. Puerto Ricans and Dominicans traditionally use small amounts of Calabaza, for adding to beans, rice or in sancocho, and thus will not buy a big Calabaza. For this reason the markets will cut them up and wrap them in plastic (Figure 4). The disadvantage of this practice is that by cutting the squash it reduces the shelf life. Since kabocha types are much smaller than traditional Calabaza types, the markets do not have to cut them since one kabocha is the size that families will use. Sometimes the market will cut a few of the kabochas so that the consumer can see the deep orange color to make sure it is what they want (Figure ??). Kabocha varieties are more of a bush type and can be planted at higher plant populations than vining types of cucurbits. For production and pest management, refer to the New England Vegetable Management Guide and click on "pumpkin and squash”. 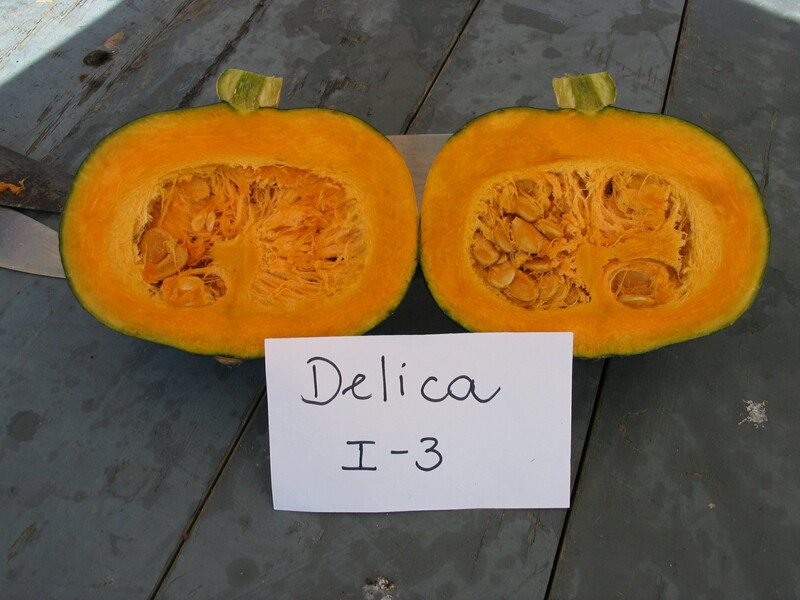 Many seed companies offer Kabocha varieties. Including: Sakata Seed Company , Kitazawa Seed Company, and Johnnys Select Seeds. Serving Size 85g : Calories 30. Carbohydrate (g) 7. Protein (g) 1. Fat (g) 0. Fiber (g) 1. Calcium (mg) 200. Iron (mg) 0.4. Vitamin A (IU) 3850. Vitamin C (mg) 9.